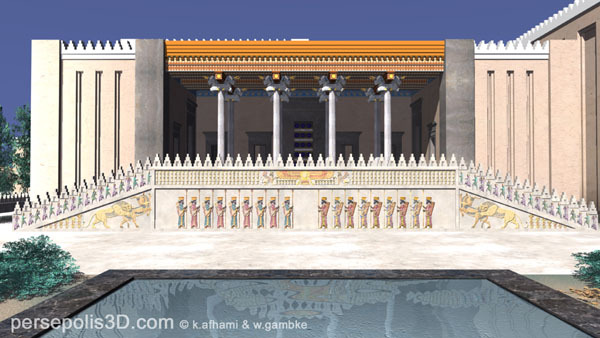 LONDON, (CAIS) -- The exhibition of �The Splendor and Grandeur of the Great Kings, The Persian Empire� will be held by Persepolis3D.com in the Historical Museum of the Palatinate in the city of Speyer, Germany from 9th of July to 29th of October 2006. �We are pleased to announce that we are creating a unique multimedia presentation for a special 2006 exhibition at the Historical Museum of the Palatinate,� said Persepolis3D.com in its announcement. Persepolis3D, a Persepolis Reconstruction Group, consists of Iranian and German filmmakers who during a unique endeavor produced a 3D movie about Persepolis historical site in Fars province, with the title of �Persepolis, a Reconstruction�. The aim of this group from producing this movie is to introduce the dignity of the Persian Empire during the Achaemenid dynasty (550-330 BCE) and keep its memory alive forever. In October 2005, the second long documentary movie about Persepolis was released by ARTE Television, a government-owned television station shared by Germany and France, by using the art of digital visualization and through using the computer technology. The work was entitled �Persepolis�. The first movie about Persepolis was produced by Farzin Rezaeian, entitled �Persepolis Recreated�. By the invitation of ARTE Television, Kourosh Afkhami , Iranian architect in partnership with Wolfgang Gambke , German architect in a joint project developed the Persepolis3D project by creating the digital modeling of monuments in Persepolis. �The goal of this endeavor is to bring Persepolis back to life � not only to show the complexities of its urban design but also to illuminate the wealth of details to a wide spectrum of both professionals and interested laymen alike. The presented virtual reconstruction is based on the documentation obtained from the excavations led by E. Herzfeld, F. Krefter and E.F. Schmidt. Especially helpful to our project was the tremendous efforts of the architect, Friedrich Krefter, who in 1933 oversaw the excavations of this bygone empire and from 1963 to 1970 established a set of standards for Persepolis and therewith, a wealth of reconstruction drawings and two scale models of the great terraces the Achaemenid residential palace including its volumes, the great entrance vestibules and interiors are all standing once again before our eyes,� says Persepolis3D.com group. Using the methods of digitalization, the TV documentary, �Persepolis, a Reconstruction� rebuilds Persepolis at the time of the Achaemenid Empire. In the film, the evaluated findings of archaeologists and factual evidence are competed with historical events through digital reconstruction; therefore, it will provide the viewer the chance to obtain a 3D image of the grandeur and splendor of the colors of Iranian palaces. The result of this collaboration in the form of a 60-minute movie was shown at the World of Achaemenid conference which was held on the sideline of the exhibition of the �Forgotten Empire, the World of Ancient Persia� at the British Museum. It is a well-made movie with beautiful cinematography that contains 12 minutes of the Afkhami-Gambke virtual reconstruction images. �Just as there are many books about Persepolis with different perspectives and various interpretations, so films too reflect various conceptions of the wide and majestic ruins of Persepolis. The present film is based on the work of Krefter, whom I knew to be a most friendly and skillful architect dedicated to his work at the Achaemenid site. It is a pleasure to see his work continued in a new medium and realized in such a competent manner. I can only praise the result and hope that we gain new insights into the numerous aspects of the masterpiece of Persian culture, which is Persepolis,� said Richard Frye, Professor of Harvard University. 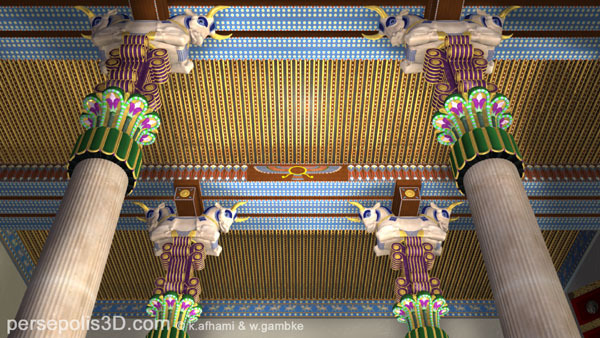 During the Splendor and Grandeur of the Great Kings-The Persian Empire exhibition, in addition to archaeological findings and several artifacts that will be shown in Germany for the first time, the visitors will see the virtual reconstruction of Persepolis in an innovative format as they stand in the center of four screens. The museum will also display a column capital model of Apadana in 1:1 scale based on the reproduction plans of persepolis3D.com. The exhibition will present the wealth, prosperity, and culture of an empire that brought people together with its magnificence from various origins and cultures during the Achaemenid dynastic era from the time of Cyrus the Great until Darius III. Persepolis was the vision of Darius the Great, Achaemenid Emperor, who set forth his plan of a multi-cultural state in which diversity of ideas took precedence over dictatorial oppression. The air of tolerance, leniency and dignity of mankind are manifest in the artistic symbolism of the architecture of Persepolis. According to Persepolis3D.com, it is only through this type of master planning - born not of any single, preexisting architectural concept or idea - that an architecture could arise whose grandeur leaves little doubt as to its place as one of the greatest wonders of the Ancient world. Kourosh Afhami is an architect and co-founder of the Persepolis3D project. In 1993, he received a Diplom Ingenieur in Architecture from the Fachhochschule in Trier, Germany. As a student, his concentration was on design and planning, town planning, theory of architecture, as well as the history of Iranian architecture. In 2001, his life-long studies and interest in the architecture and history of Persepolis led him to the development of the Persepolis3D project in partnership with Wolfgang Gambke. He has worked on numerous competitions and projects in various architectural firms as designer and planner, including, but not limited to, the offices of Professor Gottfried Boehm in Cologne and Chapman Taylor in Duesseldorf. Examples of his work noted in industry publications include: Co-developer of concept for interior architecture, 'The November Pogrom 1938' exhibition, Historical Museum of Vienna, 1988 exhibition brochure; Architekten - Monographie Hermann & Valentiny (1991); 'City Cultural Hall in Worms' in Wettbewerbe Aktuell Magazin (1991); 'Pic & Cloppenburg Building in Berlin' in Baumeister Magazine (1995). Wolfgang Gambke is a graduate of the Fachhochschule of Architecture in Duesseldorf, Germany. Prior to completing his degree in 1986, his core studies involved planning and construction. In 1987, he incorporated Information Technology into his work and gained expertise in operating systems and various programs of CAD in 2D and 3D. Since 1989, he has been working in virtual architecture visualization area and teaching courses in building construction. 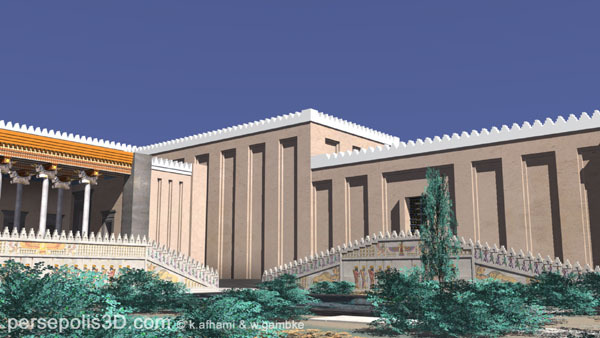 In 2001, after years of experience in architecture with computers , he created Persepolis3D with Kourosh Afhami. Sheda Vasseghi handles public relations for the Persepolis3D project. As an adjunct professor, she taught at Germanna Community College in Virginia. She brings to the team her knowledge and experience in public relations and human resources management, as well as her legal background in US intellectual property law. Ms Vasseghi received a BA in Interdisciplinary Studies (emphasis Biology) from the University of Missouri in 1989, and a MBA from Strayer University in 1998. Her MBA thesis was entitled The Virtual Organizational-Management Structure is Not Suitable for the Legal Industry. She is currently pursuing a Masters in Ancient History (emphasis ancient Persia) at the American Military University. She plans to focus her writings and research on the Achaemenid period.